Richard Gere, Winona Ryder, Anthony La Paglia, Elaine Stritch, Marybeth Hurt. ourselves, not that that makes it bad, but it makes it almost too predictable. Richard Gere is a 50ish man about town and a chef. Winona Ryder is a wan young woman who falls in love with him. They have an affair. He thoughtlessly betrays her and has to win her back. This is complicated by her state of health. And there you have it, autumn in New York, no more, no less. 1. A romantic comedy? The age difference in the lovers? 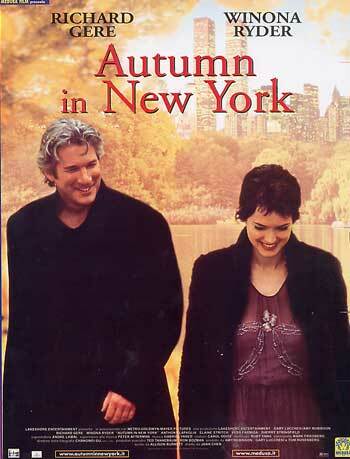 Autumn in terms of age, of illness and dying, of the seasons in New York? 2. The New York locations, the streets, apartments, restaurants? Parks and gardens? New York landmarks? The vitality of New York as a character in the film? The musical score, romantic, poignant? Songs? 3. The credibility of the plot, the relationship between Will and Charlotte? The changes in them? Charlotte's illness, Will's love and concern? The medical aspects of the film? The solution? 4. Richard Gere as Will: his age, appearance, screen presence? His running the restaurant, his skills, friendship, with his guests? The friendship with John, talking things over with him, the confidant, his wife and children? The party? John taking him to task about his behaviour with the woman on the roof? His seeing Charlotte, attracted towards her, meeting Dolly, memories of the past? The generosity at the restaurant? Phoning Charlotte, her response, going out with her? The romantic scenes in the city? John's party, his behaviour, his lies to Charlotte, her angry reaction? The effect on him, thinking about himself, relationships? Meeting Lisa, her visit to him, the revelation of his past, her mother, his abandoning his daughter? Greater realisation about his self-centredness? Going to visit Charlotte, the reconciliation? Her illness, his concern, the discussion with Dolly? His going to find the doctor in Ohio? Her angry response? The build-up to the surgery, his wanting to help her, love, reward? 5. Charlotte, age, shyness, the party in the restaurant, her silence, the design of the hats? The phone call from Will, her attraction, her blunt speaking about seduction and love? Their time together, her falling in love? Her playing with John's children, the truth about Will and the woman, his lying, her reaction, anger? Staying with herself? Her discussions with Dolly about Will, her wanting Dolly to tell her what to do? Her being by herself, her illness, the collapse? Hospital, reconciliation with Will, his concern? Not wanting the doctor? The surgery, the result? Her future? The age difference? 6. Dolly, Elaine Stritch's strong personality, in the restaurant, friendship with Will, the memories of the past? Her daughter, her talking about Charlotte? The discussions with Will, the discussions with Charlotte and not telling her what to do? 7. Lisa, her appearance at the library, her coming to visit Will, his reaction, his apologies, her wanting to understand her father? His relationship with her mother, abandoning them? Her helping him with finding a doctor? 8. The medical officer at the hospital, her explanations to Will about the nature of the case, not offering him hope, talking about the doctor? The doctor from Ohio, other doctors unwilling to do the operation, his doing the operation? Success? 9. The social background of New York City, the clients at Will's restaurant, the people at John and his wife's fancy dress party? The hospital background? 10. Critics not being complimentary to this film, the criticisms of Richard Gere as self-centred, over-age, the artificiality of the romanticism? Or, for audiences, a pleasant weepy and romantic drama?